How many hours per day do you spend in front of the computer? How long do you spend looking at your phone? Spending even 30 minutes in front of the computer or a phone creates enough visual strain to cause the development of trigger points through the upper traps and cervical muscles. Trigger points are nodules or “knots” within the muscle fibers that cause referred pain to other areas of the body. Trigger points are formed by overuse of the muscles which can happen from a workout or from sitting at a desk. Research shows that these trigger points in these muscles can commonly refer headaches. One study found that the visual stressor of a computer caused trigger points to develop after 30 minutes of use. This study shows that the visual stressor of the computer caused onset of trigger points more than postural stressors. While workplace ergonomics are important to decrease postural stress as much as possible making modifications such as “micro-breaks” will help decrease the onset and exacerbation of trigger points that can contribute to headaches. Headaches come in all shapes and sizes; however, we commonly find that specific muscles reproduce common patterns of headaches. The upper trapezius, sternocleidomastoid, suboccipitals, and cervical erector spinae muscles commonly refer pain in familiar headache patterns. A study done by Fernandez de las Penas looked at the correlation between active trigger points in the suboccipital muscles and intensity/ frequency of headaches. The study assessed 20 individuals who reported headaches and 20 pain-free individuals as controls. The headache group exhibited more active trigger points than the control, and exhibited a positive correlation in frequency and intensity of headaches referred from palpating the trigger points. In another study, muscles of the neck were found to more commonly reproduce headaches than muscles of the head. The upper trapezius and sternocleidomastoid reproduced familiar headache patterns more frequently than the temporalis or masseter. So, what is the take away from this information? We live in a time where we spend a lot of time in front of the computer and our phones. This can cause trigger points to form in muscles that commonly cause headaches. 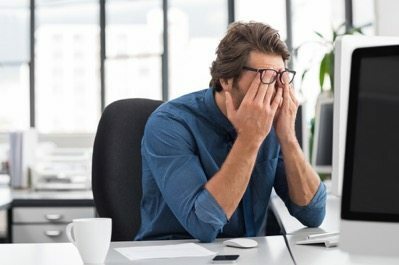 Taking mini breaks from looking at a computer or phone can disrupt the process of forming trigger points and decrease headaches. These mini breaks provide an excellent opportunity to do a couple of stretches. If you have been suffering from chronic headaches, our clinicians here at Emery Physical Therapy can help. Stop suffering and come in to see what our clinicians can offer to help decrease the intensity and frequency of your headaches. Call us today at 847-786-2014.